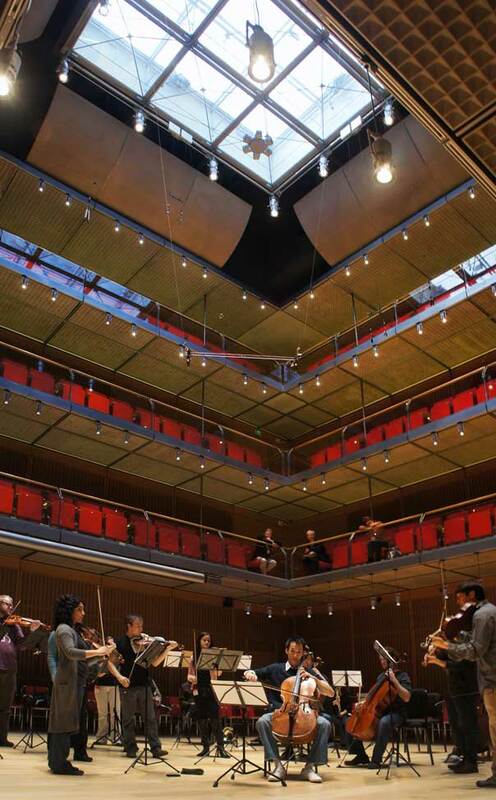 Some weeks ago, A Far Cry, the Gardner Museum’s resident chamber orchestra, got to do an early sound-check on the soon-to-be-opened Calderwood Hall that inhabits the Museum’s new Renzo Piano designed wing. Violist Sarah Darling’s musings follow. If there had been a documentary film about that morning, it would almost certainly have begun with shots of the various musicians of A Far Cry engaged in mundane tasks such as rolling out of bed, making tea, assembling the exact constellation of materials that they would need for that one day only (there’s rarely any verbatim repetition in the life of an active Boston musician), making their way to subways, buses, and cars, and converging on the Isabella Stewart Gardner Museum. Shots of faces and brief interviews would highlight a sense of excited anticipation, plus a little tension, expressed differently through each individual. Meanwhile, the camera stationed at the Gardner would catch a couple of early birds waiting patiently, then one by one, the group of musicians would swell to critical mass, topped off by the last arrivals, panting slightly. Winding its way through the museum, the next camera would certainly snag one or two looks of utter delight as we got to the light-drenched glass hallway that connected to the new wing, leading to the ultimate treat – something new and wonderful to explore, something where nothing had been before. “Welcome to your new home” were the first words we heard from violist and Gardner music director Scott Nickrenz. Always collegial and warm, today he was positively glowing. We were there, of course, to try out our new home – or perhaps our new instrument – by creating a palette of sounds for it to magnify and reflect. What we hadn’t taken into account was what a huge effect the construction of the hall would have on our musical intentions. Walking into the space, the eyes are drawn down and then straight up. The brightness of the wood illuminates the stage, which is simply the floor of the four-story structure. You feel as if you’re in an arena – or, of course, as if you’re in another iconic Gardner courtyard. There is no sense of “across” – it’s all “here.” The immediacy is almost overwhelming, providing you with a new set of musical challenges and opportunities. Where does the sound go? Where is the intention directed? 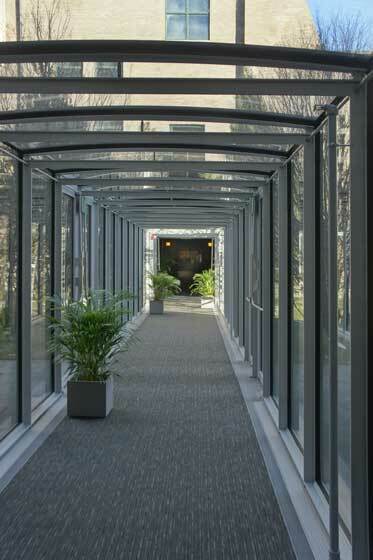 All the traditional crutches we rely on – and allow ourselves to be defined by – are tossed out the window in this hall. So. We set ourselves up for the first piece we’d brought – the first movement of Beethoven’s Quartet op. 95 in a string orchestra arrangement. We oriented ourselves in a traditional setup facing the “front” wall (where the control booth window was located) and tore in. Immersed in the waves of sound we were creating, we could sense something immediate, all the same – a sense of our acoustic selves. Much of our profession is based on acoustic impression. It goes to the very heart of what we do. The sounds that are reflected back to us in the context of our playing define how we continue – we adjust our “selves” and compensate. We articulate, we project, we sweeten the sound with vibrato,… and we are affected in more subtle ways as well. The vibrations of a room inform not just the sounds coming out of our instruments, but also their potential for expressivity, and that heads straight back into our minds and bodies. A standard observation around conservatory circles is that the practice rooms of any given school affect the sound of the graduates – and I believe it! Who did we become as we played Beethoven in the new hall? We were stark and forceful, and every shift of mood was crystal-clear. It was energizing to play in the space in which it was possible to hear all the other musicians (this is crucial — yet so rare), and also be able to enter into the violent world of the music. The hall didn’t cover anything up – if we decided to go for a less refined sound, that sound came straight out without apology. I’m speaking, of course, from the onstage point of view, which is the only one I’ve experienced. I can talk about how the sound affected our playing and what I heard, but I can’t say what it actually “sounds like” which is just as well – each of us should experience that on our own terms. However, when we stopped, we had a new issue on our hands. The setup that we had chosen was not optimal for our potential audience members. We heard this from Yasu Toyota, the acoustician responsible for the hall, who had cannily positioned himself in a chair directly behind the second violins. Sure enough, the sound and our intention were blocked in that area by our own bodies and backs. With such a large ensemble (17 artists in total), we would have to discover another solution. That’s when we truly started thinking outside of the box (or perhaps I should say “inside the box!”). Rather that set ourselves up parallel to one side, we opted to try out a diagonal line instead. That was a revelation! It was much easier to play “to” two sides of the cube, without feeling as though we were turned away from everyone else. Of course, once the first idea like this was floated, the floodgates – as they so often are in A Far Cry – were officially opened. Next, we tried bringing the outer players of the presenting line closer together, creating an orchestral shape that looked a little like an apple with a bite taken out if it. This was a very popular move, bringing the group closer to itself than it ever dares to come. It also had a good effect on the audience, because for every extra back that is turned towards someone, there is also a front that shows up on the other side. Bit by bit, we felt as though we were democratizing the audience experience. By this time, we’d switched to trying out our second and third numbers – the second movements of Respighi’s Ancient Airs and Dances and Dvorak’s Serenade for Strings. 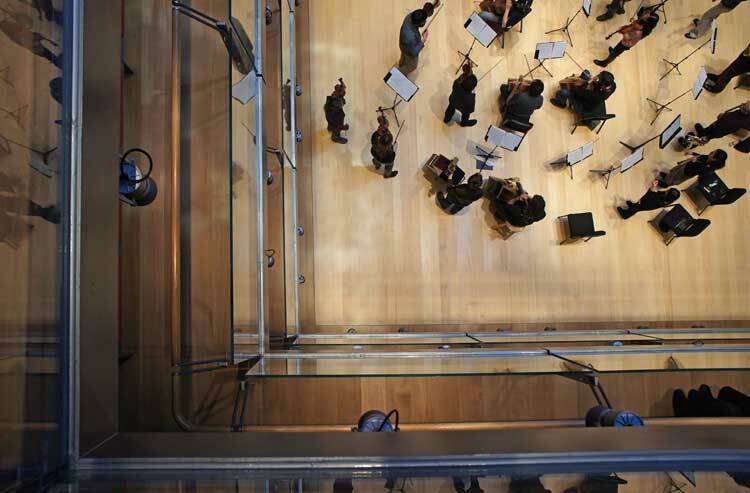 As we played and tried out different setups, we gradually became aware of another acoustic phenomenon – the need to play up to the upper balconies, and to imagine how the sound was translating in that space. With the quiet moments of the Dvorak and Respighi (we experimented with extreme softs) we tried to get a sense of what our acoustic limits might be. I’m delighted to say that we really didn’t find any. Then a plaintive request from the basses changed the nature of the morning even further. Since were were in this cube, and since so much of our sound and visual impression was directed upward, would it be possible to close our circle entirely, and let the basses into the final open space? This took some fancy footwork from the amazingly patient audio engineers, but we got it done and tried it out. And it was another great world – wonderful to have the basses, architects of so much of our structure, right up there in the thick of things, and the closed circle apparently made a great impression from the higher floors. Worried that the circle would seem too dense or unfriendly, we tried lessening our density on the ground floor by standing further apart, but were informed by Mr. Toyota that that setup was less ideal, so we gave it up right away. This new setup was much more controversial in the group, with some members feeling like it was the perfect way to honor the space and others feeling uncomfortable about its closed nature and the lack of direction. So we debated some more and tried even more extreme tactics – working with antiphonal basses, switching other sections, changing the amount of open space within the circle. And the whole time, of course, we were listening like crazy and observing the effect that each change had on us, personally and as a group – Could we see? Hear? Feel comfortable? Know where and how the sound would go? It was really over that span of time, as we tried one option after the next, that I personally became aware of what an amazing gift to Boston this new hall really is. The space embraced every option we tried, leading us to even greater flights of fancy. Over the two hours that we were in there, we had been given a huge new dose of freedom and a fluid new identity to explore. It’s clear that this is a work in progress, and that our work in the space will evolve and change the more time we spend in the hall. Meanwhile, the hall sits there, waiting to be filled with sound. And from my perceptions of that morning, I can say as a musician that the sound-world it offers us is equally freeing. It doesn’t alter what you bring to it. There’s no need to fight it, and there’s no sense that it’s glossing over your edges. It faithfully magnifies whatever you have to offer. I wonder if it might not be my definition of a perfect instrument. It’s ready for anything — but as you gradually improve, it stays right there with you, smiling a mysterious smile. Sarah Darling, a violist with A Far Cry, pops up anywhere and everywhere around town in early, classical, and contemporary circles. Thank-you for sharing your unique insights into this very exciting process! We are all waiting with bated breath to get into the hall and hear some music. I was there Tuesday evening and heard A Far Cry play the Britten. I was in the first tier above the violins. When the first speaker entered, there was applause that was quite painful to my ears and I was afraid I might find the rest of the experience painful too. I was relieved when subsequent ovations seemed muted; though in volume only, not in enthusiasm. It was an excellent performance and it was possible to hear all the parts quite distinctly and clearly. The balance was very good. As has been explained by others here, the sound had a good blend but there was no hint of muddiness. The musicians I later spoke with, among them Ms Darling, added that they were able to hear themselves and the other parts clearly. It was obvious that they had enjoyed playing there a great deal. My view of the performers was very good. I longed for new glasses so I could read their music better. The folding theater-type seats in the tiers are quite comfortable and, because there is only one row, no one’s view is blocked by leaning forward to look down. The hall is visually appealing and encourages the happy anticipation of what is to come that a beautiful auditorium does. I was a bit skeptical when I began hearing about the unusual design of the hall, but after experiencing it for myself, I am very pleased with it and look forward to hearing other concerts there. It should be a real treat to hear some of the other first-rate musicians that Mr. Nickrenz routinely brings to the Gardner.